Powerful, Consistent Cooling Airflow Regardless of Engine RPM and Show Stopping Looks! Be Cool's Show & Go Series Fans are ready to hit the show car scene! They feature chrome plated cages and have a polished billet aluminum motor cover. Select models have polished stainless steel shrouds in single or dual fan applications for crossflow and downflow radiators. Show & Go fans are available in a wide variety of CFM (cubic feet per minute) ratings and applications with distinct fan blade shapes. Made in both puller and pusher models with everything from a single 11-inch fan to a dual shrouded 13-inch fan set, all Be Cool electric fans feature sealed a motor with a lifetime guarantee. 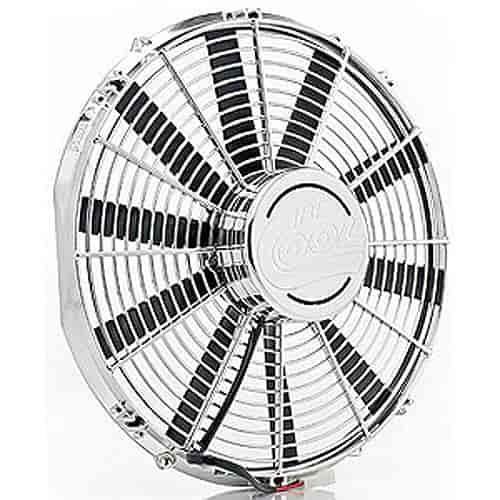 Be Cool's high-torque electric fans offer a powerful, consistent cooling airflow regardless of engine RPM. This compares very favorably to an engine-driven fan's output, which is limited by engine RPM. At slow driving speeds, such as during a cruise or a parade, an engine-driven fan is producing the least airflow when your engine actually needs more cooling air. Be Cool fans not only provide the airflow needed by your cooling system at low speeds but, in most cases, they also allow for the removal of a vehicle's engine-driven fan which can result in a significant horsepower gain as well as fuel savings. Puller fans mount on the engine side (back) of the radiator core and pull air through the radiator core. The fresh airflow is pulled through the grille, then pulled through the core, and exits out the back side of the radiator. Puller fans are the desired and most common way of mounting a fan when space is not a limitation between the front of the engine and the back of the radiator core. Pusher fans mount on the grille side (front) of the radiator core and push air through the radiator core. Fresh airflow enters through the grille, then is pushed through the radiator core, and exits out the back side of the radiator. Pusher fans are used typically where there is a limited amount of space for a properly sized puller fan. When choosing an electric fan, always select the fan that has the highest CFM of airflow with the most powerful fan motor your available space (height & width) allows. This ensures you have chosen the most effective fan for your application. Be cool offers a couple motor choices: Super Duty, Hi-Torque, Medium Performance, and Thin Line. The Show & Go Series also offers the widest range of vehicle applications: daily driving; Road Course, Off-Road, Drag, or Circle Track racing; towing; drifting; and extended idling, such as parade vehicles. All Qualifier models have a high-tech Euro-Black finish. Super Duty Motor - Be Cool has the answer when you need the maximum airflow possible from a single 16'' electric fan. The Super Duty motor produces 3,140 cubic feet of airflow per minute (cfm) when mounted against a radiator core. This is the highest-rated CFM available from a through-the-radiator-core 16'' electric fan. The Super Duty fan motor requires a high-amp alternator and Be Cool's 40-amp waterproof relay to produce peak performance and durability. High-Torque Motor - Be Cool High-Torque fans feature an enhanced motor design that ensures you get the maximum possible fan output from a reduced-depth electric fan while benefitting from fan motor life that is second to none. Be Cool's most popular through-the-radiator fan offers a tapered protective grate with a sealed, waterproof high-performance electric motor. The High-Performance fan motor also requires a high-amp alternator and Be Cool's 40-amp waterproof relay to produce peak performance and durability. Medium Profile Motor - Be Cool's Medium Profile fans are perfect for when you require industry-leading airflow but don't have the space required for our more powerful fans. Our Medium Profile fan motor utilizes the same European technology as our High-Torque fans, but packages it into a smaller size with slightly less CFM output. This series of fans provides the maximum airflow possible in a space-saving design. Thin Line Motor - Be Cool's Thin Line Fans are ideal where space is a problem. They can be used as a helper fan to enhance the original engine-driven fan's output, an intercooler fan, or an A/C condenser fan.